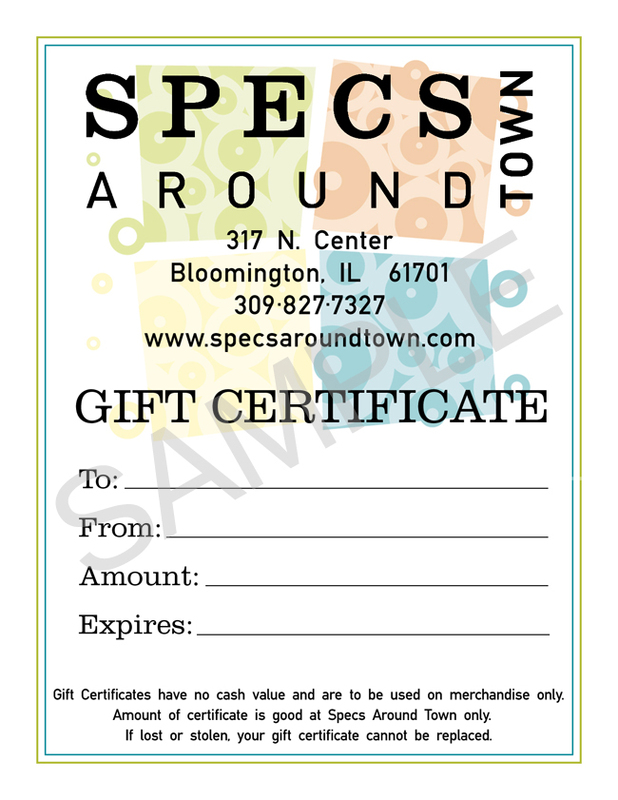 For your convenience, Specs Around Town offers gift certificates to purchase online in $100, $300 and $500 denominations. Gift certificates will be mailed via the US Postal Service to the purchaser. Please allow 3-5 days for delivery. You may also pick up your purchase at the boutique. You will have the opportunity at checkout to enter your mailing address and phone number. We use Paypal as our payment gateway, you can choose to use either your credit card for your payments OR if you have a Paypal account you can sign in and use your Paypal account to make your payment. During checkout you will have the opportunity to enter your mailing address and contact phone number. All gift certificates will be sent to the purchaser via United States Postal Service unless you choose to pick it up in the store. Gift Certificates have no cash value and are to be used on merchandise only. Amount of certificate is good at Specs Around Town only. If lost or stolen, your gift certificate cannot be replaced.